The job of a brand manager is to create a lasting impression among their consumers and to improve their company’s product sales and market shares. These individuals monitor market trends and oversee advertising and marketing activities to ensure the right message is delivered. It’s a fast growing career field with the projected percent change in employment from 2014 to 2024 at 9 percent according to the Bureau of Labor Statistics. For consumer goods companies and retailers such as Procter & Gamble, a Brand Manager position makes sense—it’s all about the product, placement, price and promotion—but what about the healthcare industry, in particular pharmaceuticals? Is a job as a Pharmaceutical Brand Manager unique and is it a good choice for MBA candidates? What Does a Pharmaceutical Brand Manager Do? Of course, the exact role of a Pharmaceutical Brand Manager will vary between companies, but in most cases, you can expect the same functions and responsibilities. So, how does this vary from a non-pharma Brand Manager? Surprisingly, there aren’t many differences except there are certain skills that a Brand Manager in the pharmaceutical industry should focus on more intently. According to Vrajesh Jha, who has worked in both the pharmaceuticals and fast-moving consumer goods industries, there are some differences, and he recently shared his five tips for Pharma Brand Managers on LinkedIn. Tell Better Stories: While other industries have brands that are created early in the development process, this can be different for pharmaceutical companies. Pharmaceutical Brand Managers need to be able to tell stories and engage with R&D at the beginning of the process to identify opportunities, develop and test prototypes, and brand concepts. Create Brand Loyalty: As a Pharmaceutical Brand Manager, you need to put effort into gaining buy-in and engagement from patients. Appeal to Emotions: According to various scientific studies, people feel first and think second. As a Pharmaceutical Brand Manager, patients should not be treated as the exception. Successful pharma companies are built on a foundation of both rational and emotional elements. According to PayScale, a Brand Manager earns an average entry level wage of $67,555 per year. For a mid-career Brand Manager or one with an MBA degree, you can expect to earn $75,218. However, that salary increases drastically within the pharmaceuticals industry. According to Glassdoor, a Pharmaceutical Brand Manager at Novartis Pharmaceuticals can expect to make between $127,781 and $153,956 a year and at Teva Pharmaceuticals they can expect to make between $98,589 and $132,157 per year. An MBA is not required to work as a Pharmaceutical Brand Manager. However, it can’t hurt. Teva Pharmaceuticals states that an MS in Marketing or MBA is preferred while AltaThera Pharmaceuticals only requests a bachelor’s degree. However, in both cases what isn’t optional is experience. Kimberly Whitler, a Forbes contributor and MBA student who went into Brand Management, also repeats this requirement for experience. “When I talk to executive recruiters who place C-level executives in different roles, they care about the ‘training’ and ‘experience’ a job candidate has had, particularly in the formative part of their career,” said Whitler. She went on to explain that recruiters know that while MBA programs can help you develop into a business leader, they aren’t likely to train you to be the best marketer. So, while an MBA is valuable, experience is even more so. UCLA Anderson School of Management: At UCLA Anderson, MBA students can specialize specifically in Brand Management. This focus requires students to take courses in Advertising, Consumer Behavior, Price Policies, and Marketing Strategy. Northwestern Kellogg School of Management: One of the offered majors is Marketing, which provides students with the consumer behavior and marketing analytics tools needed to be successful in brand management. In fact, a few of the potential courses are Strategic Brand Management, Biomedical Marketing, and Consumer Insights for Brand Strategy. 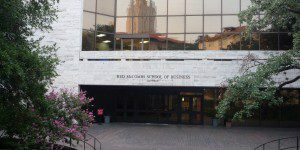 UT Austin McCombs School of Business: At McCombs, one of the MBA concentrations offered to students is the Brand and Product Management concentration. Courses include Brand Management, Scientific Marketing Analysis and Implementation, and New Product Development.